Former Aberdeen manager and current non-executive director Craig Brown once remarked that there were few weaknesses to Ryan Jack’s game, and that if he was to ever leave the Pittodrie club, he would expect it to be in favour of joining a top four or five side in the English Premier League. Brown is not the first admirer of the holding midfielder. It was once claimed by Italian football agent Ivan Reggiani that Serie A teams AS Roma and Napoli ought to be monitoring the player’s progress and after an elegant performance in a Europa League defeat of FC Groningen, many suggested that Jack’s continental style of play would suit the Dutch Eredivisie. However, yesterday the Aberdonian’s career took a slightly different path as he signed a three-year deal to become Pedro Caixinha’s second summer signing. Jack’s performances in an Aberdeen shirt have often provoked scrutiny and debate, largely because he is a different type of midfielder. With just 11 goals in 250 appearances, it must be recognised that he is neither a box-to-box runner or a tough-tackling hard man. However, that should not detract from the qualities that have made him a linchpin in Derek McInnes’ side. What Rangers will be getting in Jack is an intelligence that manifests itself in composure and ball retention. It is no coincidence that some of his finest displays have come on the European stage, as arguably that is where these attributes are most free to flourish. Against Real Sociedad in 2014, Jack looked at home in the company of talismanic midfielders Xabi Prieto and Rubén Pardo. A year later as Aberdeen pulled off the unthinkable in Rijeka, he was the model captain urging calm while adrenaline rates were soaring. The ability to transition defence into attack at pace is rare among Scottish defensive midfielders in today’s game and Jack is one of a select group capable of doing so effectively. He is at his best when given the space to collect the ball in a deep position and spread play to wider areas. Additionally, he is not lacking in neat touches or flicks to evade close attention, as was captured by a backheel nutmeg of Mikael Lustig in the Scottish Cup final. The true test of Jack’s value to Rangers will ultimately be in how he performs in big domestic games, such as those against Aberdeen and Celtic. Perhaps a question mark that hangs over the 25-year-old’s head is his performance record against the champions. While he is capable of dictating the tempo of football matches with an acute passing ability, he doesn’t have the same fiery manner as counterpart Scott Brown and on more than occasion has found himself bullied by the Celtic captain. That said, Jack went some way to addressing the reservations some might have of him in this regard with an assured display on Saturday 27 May. Caixinha prefers a 4-3-3 system, in which Jack will likely operate at the base of the midfield and prove a key component in possession-focused play. If he is to be allowed to do his job, however, he will need both a guardian angel and an attacking outlet. Under McInnes, Jack was supported defensively by Graeme Shinnie, who pressed relentlessly and won the ball back, and offensively by the driving influence of Kenny McLean. 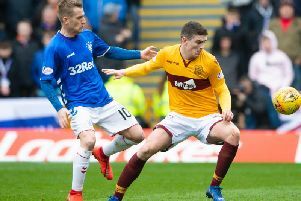 While Josh Windass has shown glimpses of creativity, arguably Andy Halliday and Jason Holt have not shown the required grit to complement Jack’s relaxed footballing persona centred on neat close control and stretching the play. Therefore, if the Portuguese manager is to get the best out of the midfielder, he may have to introduce one or two fresh faces to help him out.